Reviewed by Dan Hastings on April 19th, 2018, playing on PlayStation 4. Slaying an entire building full of gangsters because person dressed in a giant bunny costume told you to. Doesn’t get much more random than this! 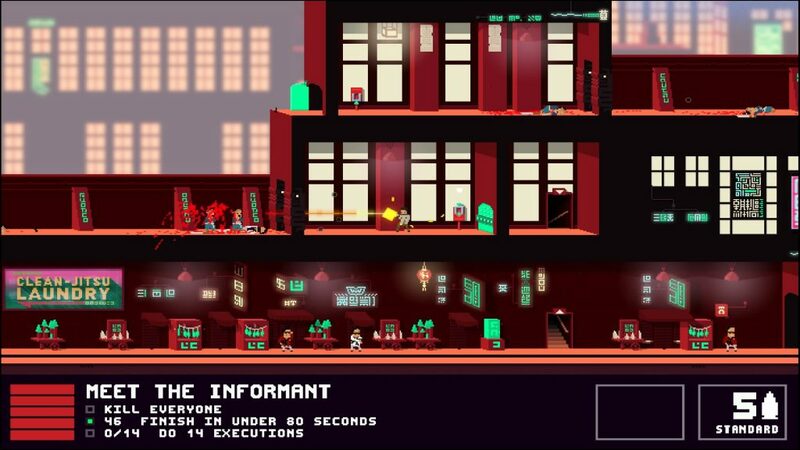 Not A Hero is a fairly weird and crazy game that feels a bit like an 8-bit version of Stranglehold. Slide tackle enemies, dip behind cover and blow the crap out of everything you can. This action side scroller from the developers of Hotline Miami is full of brutal 8-bit murdering and high paced shooting. You start with a single playable character called Steve, a rough and ready hitman. He is best friends with bunny, the man in a large purple bunny suit who gives the orders. Bunny is currently running for election to run the Great Britain and you need to help him out by doing everything he asks of you. It sounds weird and it is. The story and every piece of dialog in the game is a real weird and dry style of humor. Some of the conversations you have with bunny between missions are hilarious. Things don't really make much sense and this is the fun of it all. The humor is most definitely the best part of this game. The voice acting for each of the characters, is minimal, yet very entertaining. The Jesus character is a very flamboyant man in a pink shirt who pulls out a martini as part of his death animation. The visual style is really nice. Compared to other similar 8 bit themed games, Not a Hero is very minimal. Levels and characters are all as simple as they can possibly be. The animations were all very quick and simple which work well with the high pace of the action. For fans of chiptunes, the soundtrack has a lot to deliver. The early levels in particular have a lot of catchy 8-bit, NES style tracks. They work perfect with the visual style and the pace of the action on screen. Each level will have its own song, very like the retro NES games that inspired this game. There are a total of 21 levels, each with a primary objective and three secondary objectives. Completing the primary objective allows you to progress to the end of the level. Completing the secondary objectives is optional. Each objective you complete will improve Bunnies political approval rating. As the approval percentage goes up, you begin to unlock new playable characters. The characters vary quite a bit with each having pros and cons. The balance here is quite poor. Some characters are absolutely useless and others are blatantly overpowered. It would have made more sense to make some missions better suited to some characters to give you a reason to go back and replay past missions. You can beat the entire game as Steve if you wish. Like most side scrolling shooters, the controls are simple. 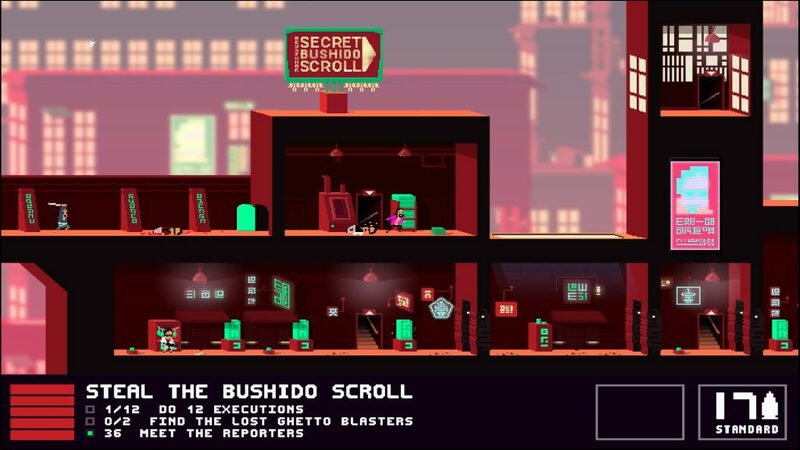 Move from left to right, shoot your gun at enemies and best of all, slide around the place like some kind of ninja. There is no jump button in this game, instead of jumping you slide. It seems weird at first, but after a while it is really cool. It is not possible for you or enemies to aim up or down. You can only shoot straight in the direction you are facing. When you slide, you are in a place where enemies can’t shoot you. This makes sliding a highly valuable mechanic. Upon entering a room you can slide across the floor to tackle an enemy. When an enemy is dazed after a tackle, you can perform a ground takedown to kill them immediately. Sliding also allows you to take cover. This is a bit of a clunky system which often results in you getting killed rather than saving your life. You can be standing right next to cover and press the slide button. Rather than take cover you will zip across the floor to tackle an enemy. If there are five other enemies next to him you usually get killed. Getting killed is something you need to be well prepared for. Initially, you can be shot five times before you die. Compared to Hotline Miami, this seems easy, however the difficulty scaling is a complete mess. The first 12 missions were fairly easy if you take your time and plan how you are going to attack enemies. More powerful enemies are introduced along the way which take more shots to kill and can kill you in 1 shot. Since the cover system is kinda useless and since stronger enemies are immune to slide tackles, things quickly get much harder. For the most part it is bearable, until you go to China. The difficulty level jumps up significantly when you get to china. The challenge is fun at first, but after a few levels you will start to get pissed. Ninjas are everywhere and they kill you in 1 hit. They can take a dozen bullets before they die, which makes no sense considering they are just wearing robes. They are immune to slide tackles and run faster than you can. Running away rarely works and you can't block them once they get to you. Getting through the Chinese levels is a matter of learning where every single ninja is, through trial and error. It begins to feel like those “I wanna be the guy” games. There are no checkpoints in Not a Hero. Not a big deal early on, but it is toward the end. The levels are long and require you to execute every single thing perfectly. You need to learn where every enemy is, figure out the best tactic to clear a room and so on. If you get to the very last part of a level and die, you are back to the very start. For a game with only 21 basic levels, you could spend hours trying to beat each one of the last 6. First you need to learn how the best strategy for the level and then you need to execute it in one clean run without mistakes. If you are someone that angers very easily, I wouldn't recommend you play this game. Difficulty level does not scale evenly. Overpowered enemies result in cheap deaths. Cover system doesn't work very well. 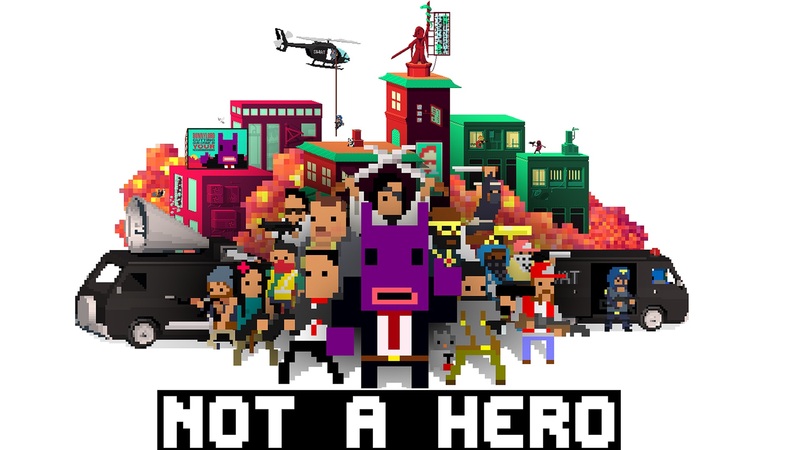 Not a Hero starts out very strong and you will really enjoy the first 10-15 levels. Once the difficulty level goes through the roof the fun stops. The dialog is funny and the game itself is just weird and funny. The occasional laugh is not enough to make up for the frequent angry groan. The final few missions in the game are incredibly difficult. Hotline Miami was difficult, but at least everyone died in 1 shot. 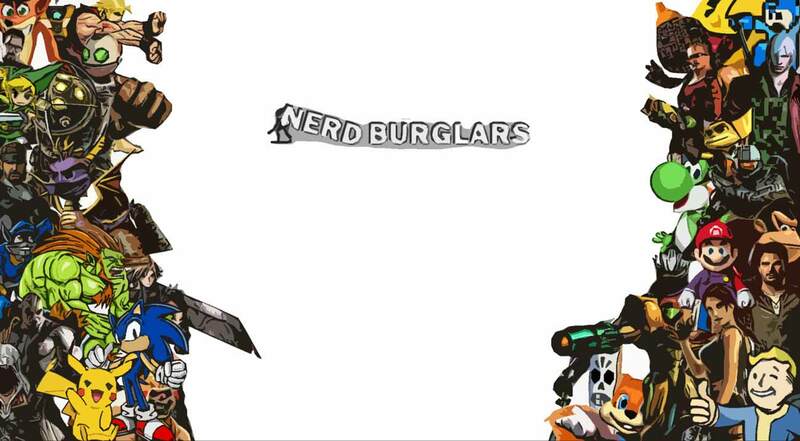 Not a hero is a challenging game that does not give you an even playing field against the enemies it throws at you.